This update initially started as a brief commentary following the US Federal Reserve’s decision to increase interest rates which was announced last week. However, we decided to provide a general update as well. We are counting down the days to see whether the government will indeed trigger Article 50 at the end of March, which will formally start the countdown to the UK’s departure from European Union. In the US, President-elect Trump has started to put his team together but exactly what his policies will be remains to be seen. Generally speaking, and notwithstanding the significant challenges experienced in 2016, it has been a good year for equity markets in developed, Western countries. However, it is easy to overlook the fact that the UK’s FTSE 100 dropped dramatically at the start of 2016 and, whilst it is currently trading close to 7,000, it was as low as 5,700 less than a year ago. US equity markets have surged following the Trump election victory in anticipation of greater spending and fiscal freedom; seemingly ignoring the increased national debt that additional spending will surely bring. It has been more challenging for the Asia Pacific region and emerging markets, especially since the US election and President-elect Trump’s well-publicised intention to cancel the ‘Trans-Pacific partnership’ trade agreement in an attempt to repatriate manufacturing back to the US. There are parts of the UK economy that are performing strongly. However, there are parts in turmoil such as the steel industry and the documented problems with retailers such BHS. It is far too early to tell what impact Brexit will have on businesses whether they are small, medium or large. 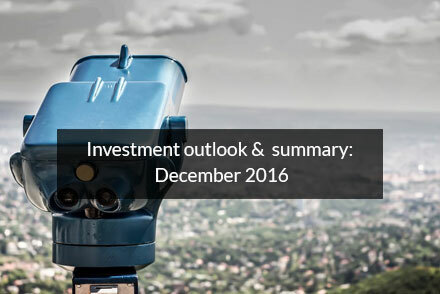 Inflation remains at a very low level, but 2017 is likely to see inflation rising as the gradually increasing price of oil and the impact of the falling value of Sterling impact on prices. Having recently booked an identical holiday to the one taken in 2016, we noted a 20% increase in price and, with wage inflation remaining relatively low, UK consumers will more than likely have less money in their pocket in 2017. We have historically been fans of ‘bricks and mortar’ commercial property funds – funds that themselves physically own buildings such as warehouses, shopping arcades and retail parks. Performance of these funds has been strong between 2013 and early 2016, but the referendum result immediately impacted these funds. Given the volume of potential hurdles for the UK and wider global economy, it is fair to say we are not hugely optimistic about the short-term outlook for commercial property but a diversified portfolio is the key to long term investment success. We will therefore continue to recommend commercial property investments. 2016 has been an extraordinary year politically and 2017 is likely to be equally challenging because of the UK referendum and American Presidential election results. There are several important European elections on the horizon to which will add further uncertainty. We will continue to work closely with our investment research partner Financial Express to build suitable portfolios dependent upon your personal circumstances and objectives and, as always, would be happy to provide any further information that you might require. US Federal Reserve raising interest rates: What happened? On Wednesday the US Federal Reserve raised interest rates from 0.5% to 0.75% and hinted at further rises to come in the New Year. Announcing the rise, Fed Chair Woman Janet Yellen put the decision down to improving economic trends, saying “growth is a touch stronger, unemployment is a shade lower”. Nevertheless, rates are still at the bottom of the barrel by any historic measure, owing to the Fed’s longstanding quantitative easing programme aimed at increasing liquidity. And this is only the second time they have raised rates since they started to do so last year so. The chart below, showing US interest rates, reminds all of us just how far rates have fallen over the last three decades and that a 0.25% increase really is a very small change. Critics of the decision have pointed out that while unemployment has fallen, there is little evidence that wages have grown proportionally. Meanwhile, the apparent decision to bank on a promised splurge on infrastructure and tax cuts by the President-elect may yet prove premature, as these policies continue to remain as absent of detail as the rest of his programme. The first point to make is just how long it can take increases in interest rates to have any effect at all. Higher interest rates discourage borrowing, and therefore the incentive for businesses to invest. However, no business is going to disinvest from a programme they’ve already half completed because interest rates have just been increased by a fraction of a percentage point. They might however look to delay future projects until the prospects for the global economy in particular look more certain. A slowdown in investment could of course lead to a more sluggish US economy, and with that a slowdown in the world economy but, as we have already noted, until President-elect Trump’s plans are made clear it really is impossible to know what will happen next. We’re always happy to answer any questions you might have.